Cleansing facial wipes are one of my favorite beauty essentials. I always remind my clients that wearing makeup to the gym is one of the worst things you can do. Yes I am aware that when you have an ugly zit you want to cover it up, but in the long run you are doing more harm than good. While you sweat your pores open and you are inviting bacteria and makeup to seep in. Since washing your face pre-workout is not always on the top of everyone's priority list, facial wipes can solve that problem. Not only are cleansing facial wipes quick and easy to use but they also effectively remove dirt and makeup. They are the perfect solution to clean skin if you don't have time to wash your face before bed. I keep a pack in my gym bag, the car and on my bathroom sink. A couple brands that I really like and recommend are: Korres Pomegranate Cleansing Wipes and Ole Henriksen Truth To Go Wipes. For more information on facial cleansing you can read this post. You know, I have never used facial wipes, I was worried my face would get dried out. I am definitely going to pick some up though! I bet it actually gets your face more clean! Thanks for the tip Linds! This is a great tip Lindsay. I just picked up some cucumber facial wipes, called Yes to Cucumbers. Have you heard of that brand? They are supposedly all natural. I love facial wipes too! They make it so easy!! Keep these beauty tips coming! I am always open for new ideas, and this one sound fantastic! I'm guilty on not washing my face before working out...I know it's bad!! Thanks for the recommendations though I do buy face wipes for travel and love to hear what brands work well. That is awesome -- I'm guilty of sometimes not washing my face before I go to bed. Sometimes all I want to do is jump into bed! hello...I bet they smell good too! Ooooh I love this. I could totally use this right about now. Sometimes I'm just so not in the mood to scrub and rinse at night. All I want to do is lightly remove my makeup with ease. I can't imagine no foundation at the gym. My skin is pretty bad with acne scars, dark circles, the works! The vitamin c has been working wonders though!! Maybe someday I'll get to be makeup free! Ah I'm so guilty about not washing my face first... thanks for the tips! Buying these! Thank you! how's baby 2!! I love these. I am often too lazy to do the whole facewash routine before bed but I will always take a second to use these wipes. I can walk around and do other things (like check that all the doors are locked) and be removing my makeup. Love them. Great tip! I need to update my skin care routine! Thanks for all the wonderful tips! I'm guilty of this but not on purpose. I go straight from work to my Yoglates class & still barely make it on time. Wipes are the perfect solution for me but I'd never thought about it. Thanks for the tip! I am totally the type to not remember to wash my face before working out...thanks for the tip! Makeup wipes are quite possibly one of the best inventions ever! Personally, I like the double-duty ones - the wipes that remove makeup AND clean your face. How convenient is that? Usually, on a non-lazy day, I'll remove makeup with a baby oil/baby shampoo/water mixture. Works perfectly! They are the best! I have a pack of these at home and I use them a lot on the weekends. They are just quick and easy to use. I LOVE Korres!!! 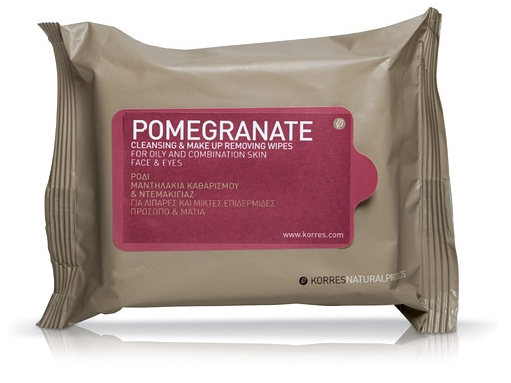 Especially, the Pomegranate Cleansing Wipes!